PORTLAND, Ore.– Fusion offers the potential of near limitless energy by heating a gas trapped in a magnetic field to incredibly high temperatures where atoms are so energetic that they fuse together when they collide. But if that hot gas, called a plasma, breaks free from the magnetic field, it must be safely put back in place to avoid damaging the fusion device–this problem has been one of the great challenges of magnetically confined fusion. During these so-called disruptions, the rapid release of the energy in the plasma can damage the fusion device: Intense heat can vaporize or melt the walls, large electrical currents can generate damaging forces, and high-energy "runaway" electron beams can cause intense localized damage. Making disruptions less disruptive involves injecting material into the plasma that evenly radiates away the plasma energy. One challenge is that the material has difficulty reaching the middle of the plasma before a disruption occurs. Researchers hope that getting material into the middle can provide "inside-out" cooling of the plasma, preventing the disruption and the production of runaway electrons. Researchers at the DIII-D National Fusion Facility have demonstrated a revolutionary new technique to achieve this "inside-out" cooling before a disruption occurs. 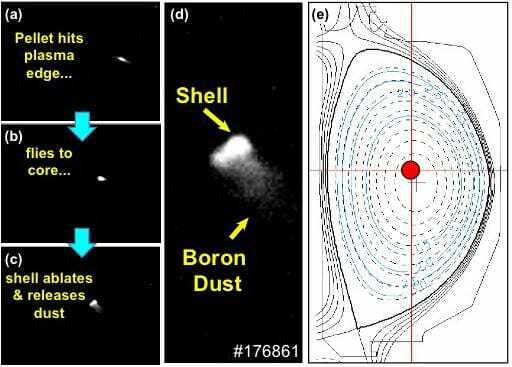 A thin-walled diamond-shelled pellet carries a payload of boron dust deep into the plasma (Figure 1). The experiments show that shell pellets fired into the core at around 450 miles per hour can deposit boron dust deep in the plasma where it is most effective. The diamond shells gradually disintegrate in the plasma before releasing the dust near the center of the plasma. The new approach transforms prospects for fusion energy by potentially solving three major problems–efficiently radiating away the plasma's heat, reducing forces by the plasma on the fusion device, and preventing the formation of energetic electron beams. As DIII-D Science Director, Richard Buttery, comments, "Shell pellets offer the potential of dealing with all three facets of the challenge, eliminating risk of device harm." Future work is aimed at creating more sophisticated shell designs that can carry larger payloads and penetrate reactor-class plasmas. Another technique being explored at DIII-D is known as shattered pellet injection. In this approach, solid frozen pellets made of a heavy isotope of hydrogen and neon or argon are fired toward the plasma at high speed. They shatter into small fragments before hitting the edge of the plasma. Researchers performed experiments and extrapolated the results to the large fusion device, ITER, being developed in France. They believe this technique will be effective in ITER. "The best way to reliably prevent disruptions remains an open question," said researcher Nick Eidietis, who works at the DIII-D fusion device in San Diego and will be presenting his research at the American Physical Society Division of Plasma Physics meeting in Portland, Oregon. "But we are making significant progress in developing the understanding and techniques necessary to achieve fusion power. If this new shell technique fulfills its initial promise, it will transform prospects for reliable fusion power plant operation."